Sign up with your email address to receive LA LUNA SOCIAL news and updates. Tecchino coffee in the am with warmed hemp milk, coconut oil and some honey. Create and finish one thing. Wash face and use sunscreen. 2. What is the mantra or kriya that is your "go to" when you are needing to realign to your dharma? I love anything by Bachan Kaur and Guru Singh. Pavan Guru is great when I’m needing some energy. I also have a soft spot for Krishna Das specifically Hara hara Mahaadeva it makes me feel very happy and connected. My spare time has significantly decreased and so has my yoga practise but to keep me feeling balanced and energized I start the day with a 1 min breath meditation- 20 sec inhale, 20 sec exhale, hold for 20 sec this feels super nourishing to my nervous system. I’ll follow with 3 min breathe of fire, aura sweeps and 5 min silent meditation. Having a sweet and short practise has been key for me to keep up! Working with plants has been an unfolding relationship. The connection of the flowers and plants has significantly developed over the years- for me the plants, their color and vibration are my muse. This is Holly Hoover aka Sangat Gobind Kaur. This magnificent multi talented, genius has roots in theatre, dance, fashion and costume design but has since turned yogi, fiber artist and natural dyer. She found plant dyeing two years ago and since then has merged her love of kundalini yoga and plant dyeing within her company, The Sangat. I am so happy to have the pleasure of working with her on our latest custom remake of the "house holder turbans" . This has been a journey of the reinvention of our Indigo Turban and knew options and styles like our newest addition... "Royal Bloom" Turban (a bundle of flower dyes with soft purples and blush pinks), inspired by The Sangats collection at Camp Grace last year along with the "Golden Chain" turban (a classic white with her original signature golden stitched trim). These are all 50ins by 2 yards and WE ARE OVER THE MOON with joy with this new partnership and friendship. Stay tune for more of this blooming collaboration. wearing the "Golden Chain" Turban. I met this beautiful queen at the second year of the Spirit Weavers gathering of 2015, we had our trading blankets laid out side by side with our artisan goods for sale or trade. At the time my Kundalini Gown collection had conceptualized to merely one sample gown, so i had my trading blacket adorned with vintage native turquoise jewelry that I curated along the way with goods from my travels around the globe. I had fallen in love with her creation. You just knew that her jewelry had a special kind of vibration. It felt like actual technology. The method behind Nikki Jacoby is created by teasing the nectar out of metal, which brings it to life and creating an emotion. Her collections range from big brass door knocker earrings to heirloom hair combs and and modern day talismans. Jewelry has always been very personal for her, she received her grandmother's collection before she passed along with stories of each piece which set a foundation for the special role that adornments can play in our lives. It is her goal to create a little bit of personal history, a story that captures a moment in time. She aims to share something special that is of high quality and will last to pass on to the next generation or friend. By the grace of god and her willingness to collaborate in bring together and giving life to a piece very near and tender to my heart. 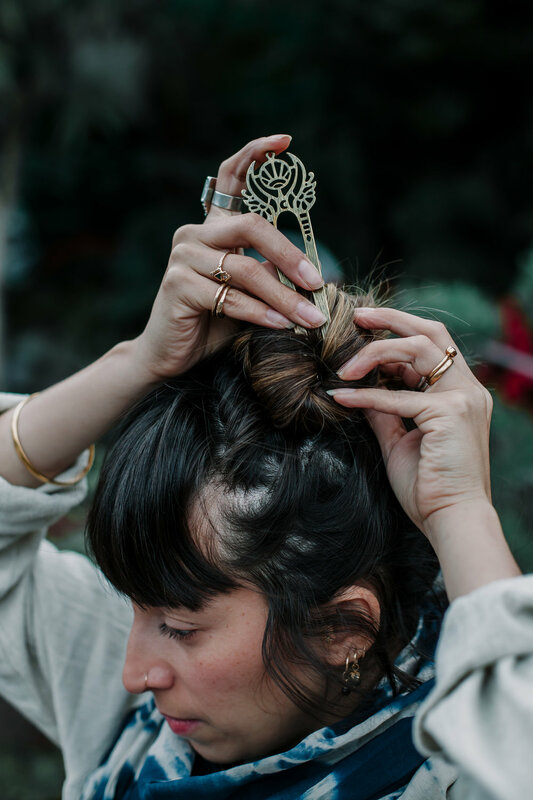 She was able to create and hold the vision of our Adi Shakti - Mystic Floral Heirloom Hair Comb pins as a true technology for the aquarian age. "These combs have a few different elements represented, the first being Adi Shakti, primal first power and divine mother energy.. Embodying light & dark, power & grace, tenderness and fierceness and the true essence of who we are as women." Nikki pulled from these themes in designing these combs with the sharpness of the swords, symbolizing the feminine STANDING in her power contrasted with the softness and sensual curves with the flower petals in bloom. "The moons are added to represent the cycles of life and our connectedness to the earth as well as being the goddess symbol and mark of the high priestess, which I believe to be in all of us." I bow to this queen for creating just that and I bow to myself for the inception. For these combs are like little mini crowns and the metals work as tools to be reminded of our sovereignty. 1. What are your daily rituals? As a mother of a magical toddler and a business owner, my daily rituals fluctuate depending on what each day brings. Lately during these cozy winter months in the Pacific Northwest, the first ritual of the day is making myself a delicious cup of coffee and reading a book to my son Kairos to start our day. I then go from there to either work in my studio or head out on an adventure with the kiddo. Cooking a wholesome meals from scratch is another daily ritual of mine, it grounds me and is a way I can nourish myself, my family as well as share love and gratitude. Music is another huge daily ritual. Listening and grooving through the day whether I am working on jewelry in my studio or hanging out with my son keeps me feeling good. Its a reliable friend that I can count on to shift my mood by the press of a button. Going for a walk is something I strive to do on a daily basis, it is an instant reset and reminder to be in my body and take a few minutes to step away from work and responsibilities and just simply move and breathe. Finding the balance of self care and ritual within my role as a mother, partner and business owner has been a little tricky, these are the simple things I have found I have space to do most days during this season of my life. 2. What mantra or Kriya is your "go to" when you feel creatively stuck or in need of a reboot? I have a couple that I use when I need to be inspired or am noticing myself slip in to an unproductive thought pattern. The first one is PMA MIW which stands for Positive Mental Attitude ( thank you Bad Brains) and Make It Work ( thank you Tim Gunn). These two unrelated pop culture references came together one summer about ten years ago with my dear sisters here in Seattle and just stuck. These two combined phrases remind me that with this mindset I can accomplish anything and get through any situation, it's a choice to get bogged down or stay in a space of immobility and frustration. I have this tattooed on my arm and am currently making a medallion with the letters inscribed, so stay tuned! The other one is a Lakshmi meditation I learned from the wonderful Adriana Rizzolo at the Spirit Weavers Gathering last summer. bringing me back to the beautiful voice of a friend surrounded by my sisters out in nature which is a huge place of power for me. 3. Who or what inspire you? Musings? I have so many inspirations! In life, it is my group of girlfriends, they are all so talented in so many different ways. I can look to a different one on any given day depending on what's in front of me and think what would ______ do? I feel eternally grateful for these friendships and constant guidance. Creatively I am inspired by architecture, vintage textiles, symbolism and hidden meanings as well as patterns in nature on micro and macro levels. The old ways of creating objects is a great inspiration as well, its a reminder that things don't have to be high tech and complicated, you just have to be clever or have a great teacher. Here with her radiant and blooming Aquarian Family. A True honor to work with such an inspiring human. Please visit her work and follow her journey through the poetry of metal alchemy. Do you remember when you wanted to come to class and you said, "I couldn't"? Do you remember when you wanted to get up in the morning and meditate and instead said, “I couldn't"? Do you remember when you wanted to love and be with somebody and decided, “I couldn't"? All the problems on this planet come from this "couldn't.” It gives us a slip from our dharma, from our destiny. We need to make our will so clean, clear and positive that "couldn't" does not touch our shores. Kundalini Yoga takes away our “couldn't” and gives us our excellence. Every sequence has a consequence. When we start a sequence, the consequence will be there. If you do not want consequences, do not start the sequence. Have that control! Control your "couldn't!" Practicing a kriya with a mantra like this one gives you a rhythm. When your life is subject to rhythm, your "couldn't" goes away. Posture: Sit straight and tall in Easy Pose, Like a Queen. Mudra: Cross the middle fingers over the backs of the index fingers, locking the other two fingers down with the thumbs. Bend the elbows and bring the mudra up to ear level. Mantra: Chant Har from the navel to the rhythm of Tantric Har by Simran Kaur and Guru Prem Singh. Be constant and consistent. To End: Inhale deeply, hold. Let the breath and the mantra multiply into your being. Exhale. Repeat. Then one more time inhale deeply and powerfully, hold, and pull the navel in. Exhale and relax. Try it, prove it wrong as a way to inspire effort. I've been gifted the name Brittany Reid. I currently reside in the flat lands of Regina, Saskatchewan where the sunset kisses the horizon and blasts the juiciest sunsets around. I am a globe trotting Sacred Business Mentor who teaches other sisters how to take their sacred calling (or discover it) online to weave a web of time and financial freedom. We tune in to turn on and live through pleasure as our strategy. It's truly a divine and liberating expression of my WHY. Alongside my wildly love for sacred business I lead ritual/ceremonies for women and entrepreneurs seeking a deeper understanding of their own innate magic within. I am a raw chocolate and matcha lover. When I am not soaking in the infinite beauty of my business I am creating wildly delicious nourishing food or adventuring around the globe with laughter and joy. A daily ritual to stay connected and in the creative flow is a morning of stillness then dance party with a touch of RnB. I enjoy waking up to cleanse my house with sage followed by pouring a warm ceremonial cacao or tea to begin my practice. My practice begins with lighting a candle and diving into my breath, gently moving my body, and finishing off with kundalini (#almosteverydamnday). Many mornings are inspired by an element or a sacred object that my heart is pulled too. You can often find me pulling oracle cards and working with spirit guides to lead the way for the day. On the full moon I am leading ceremonies in my community or designing new pieces of jewelry for Moon Child Collection and shifting my physical space on the new moon. During the Full Moon we drop into spirit with cacao, reiki, restorative yoga, and practices that are aligned with the astrology for the two weeks ahead. There is a clearing energy that rises within around the new moon; to rebirth and come into further balance within my internal and external worlds. So, I clean. I move. I sing. I take extra baths. And, I allow more space for BEING. Nutritionally I am a lover of seed cycling and syncing my rhythms in business and life with the moon. Cultivating a deeper relationship with my womb and balancing my hormones on the regular is an important practice to keep myself in a creative flow. 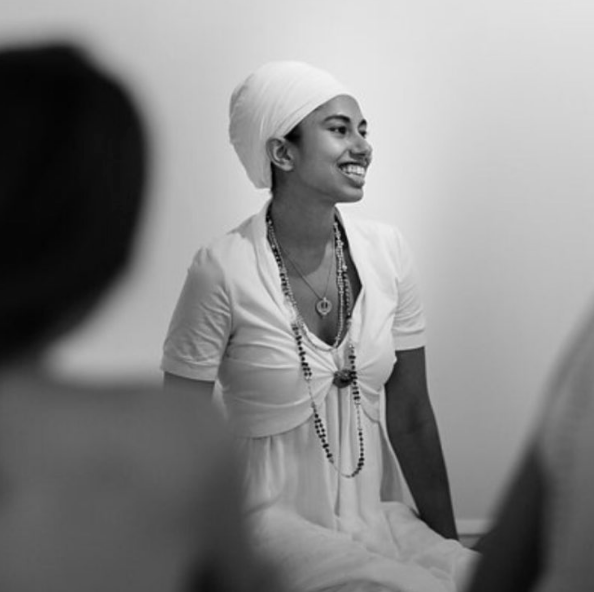 Stepping into Kundalini Gown is an divine expression of taking root into the Wombyn I am becoming. 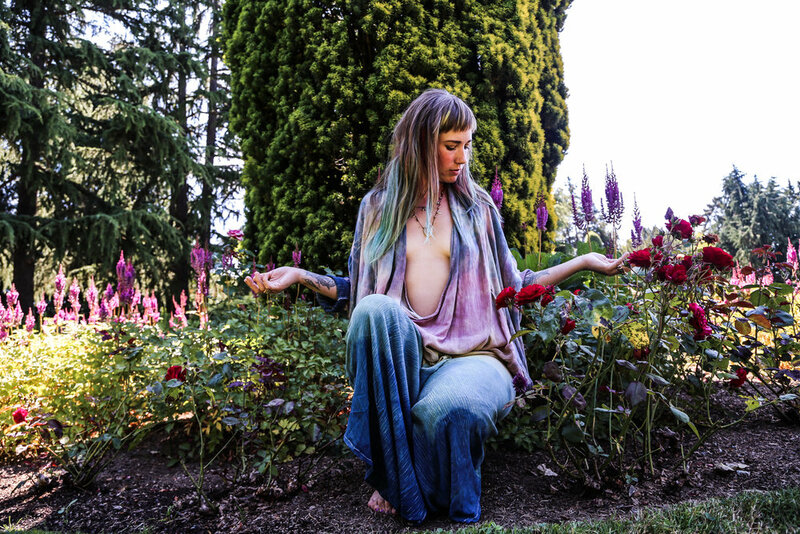 Whether it be dancing around my sacred temple, leading a ceremony, or embarking on a new adventure; the kundalini gowns gift me the radiance I feel on the inside. The art of stepping into my innate power and expressing the ancient wisdom that flows through my veins graciously. I adore Myrah and her blooming family/community. I feel deep gratitude to be sharing the expression of her souls desire. You can find me hanging out at @brittanycreid on Instagram, Brittany Reid on Facebook, and www.brittanyreid.ca. My heart is moved by sharing. I thank you. I thank you for your radiance. I thank you for sharing space with me here. I had the pleasure of meeting Giangeet Kaur at RaMa Institute in Venice Beach, CA last spring, while down sharing in on a wellness panel. She is the artist behind Satamber, Tantric Necklace Technology. She gifted my daughter and I matching tantric necklaces and I fell in-love with her graceful, angelic energy. We have since collaborated on a beautiful offering called The Aquarian Family Collection, a tantric necklace for you, your beloved and your star children. Multi-Colored Tourmaline – Is all about Protection. It awakens compassion and tolerance in the wearer, brings lightness to all situations. Gold – Abundance, wealth, infinite amount of possibilities in life. Gold has always been associated with wealth. It has the vibration of abundance. When we experience the universe as infinite we can then also experience an infinite amount of possibilities in our life. Black Tourmaline - Is very protective, it opens up an awareness in us to have a deeper understanding of ourself and our environments. This understanding aids in bringing a lightness to all situations. *The pattern of the Tantric Necklace was re-discovered by a student of Yogi Bhajan in 1983. This sacred geometry has been used for ages by masters across all traditions as a tool for higher consciousness. The mantra Aap Sahaee Hoa is chanted during the creating process for the Aquarian Family Collection. Yogi Bhajan said that this mantra will totally eliminate enemies, block the impact of animosity forever, and give us total mental self-control. AND it is said to be a prosperity mantra. WOW. This couldn't be more perfect for us as a healing tool to provide to our community. Truly excited to share this technology with you and add new sacred adornments to your temple. "The Tantric Necklace is a beautiful piece of jewelry. What makes it so beautiful is that its beauty goes beyond the physical level. This necklace is a very powerful yogic tool, and, in my mind, essential for every human being. The Tantric Necklace consists of exactly 416 beads arranged in an specific geometric configuration. The geometric configurations found in the necklace date back to the middle ages, and are even believed to be much older than that. In 1983, a student of Yogi Bhajan re-discovered this pattern in the back of an old book. Upon being shown the pattern, Yogi Bhajan called it the Tantric Necklace and he immediately requested one to be made for him. In that year the first modern day Tantric Necklace was created from Lapis Lazuli and Gold. Imagine standing in the center of 416 powerful lights arranged in a perfect circle and all aimed at you. You are illuminated perfectly from all angles. Bright as can be... This is exactly what the Tantric Necklace does. It is a powerful frequency placed in a circle around the central energy pathway of the human being, the spine. It surrounds the spine perfectly and beams the primal universal love frequency into the spine from all directions. The spine is strengthened immensely and energy now flows with ease and stronger than ever before from the lower energy centers of the body through the heart center to higher chakras. The pituitary gland becomes activated, powerfully communicating to the pineal gland to vibrate at a higher frequency. The magnetic field, otherwise known as the aura, expands, becomes wider and brighter. You are protected. You are a light standing in the pure vibration of your highest self. There is clarity. A strong sense of self. A heightened awareness. All good is naturally attracted to you, all that does not serve you is redirected by nature. This is what the Tantric Necklace does. It illuminates you in a way that no other tool can. Instantly bestowing you with countless blessings of this sacred universe." - As experienced by Giangeet Kaur, Creator of Satamber and designer of the Tantric Necklace pieces. The Aquarian Family Tantric Necklace set created especially for Myrah and her family is crafted from Tourmaline, Rose Quartz and Gold for understanding, acceptance, love, and abundance. For orders on www.satamber.com use code MYRAH for discount. Kristen is one of the first women I met when i first moved to Canada 5+ years ago and only recently has our friendship become more solidify. in the last year we have both been blessed with bright, radiant sweet girls, Sawyer Luna and Soleil Emerald Ray (the Moon and the Sun). After having Soleil, Kristen gifted us a wonderful, practical and lifesaver of a gift... a Field Work Co. Diaper Mat (that I take everywhere and every new mom must have) and a little headpiece with Soleil's name on it AND a sweet note that really touched my heart. We have been spending our summer together with our girls, bonding, dreaming and collaborating. Here is a link to our latest collaboration, inspiration came when in search of a much needed diaper bag. Her is some musings behind the remarkable, kind and talented mama. What is your morning ritual to cultivate clarity and grace? On raising a mini Artist, in what ways do you see yourself in your daughter Sawyer Luna, now that she is almost 2 years old and developing her own constitution? My mini creative soul, she loves the sun and the water. She recharges from nature, her entire being comes alive. That love and need is something our family shares, and I see so clearly in me and Luna. Her big eyes and heart take in the life around her and I can see her learning, and it effecting who she will be one day. Did you ever envision yourself living a life as a mom-entrepreneur? No. Never. It was never something I dreamed of for myself, but it is now something I can't imagine my life without. I always pictured myself going back to work, only having one child, and being career oriented. Luna changed all that. Now I want a life where I can nurture my tribe. I envision a life where I can be her anchor, her constant, and hopefully her inspiration, especially in these growing years. I see a life where creativity, work and family all blend fluidly together. What is the true essence behind“Field Work Co” and how did it come to be? Isaac, my husband. He is a creative at heart. He came home with a sewing machine, and canvas, determined to make himself a tool roll for his motorcycle trips to the mountains, and then he grew from there. When Sawyer was born he started Fieldwork as a passion project turned business to provide for our family, and when Sawyer was around 5 months old I was feeling creatively restless. I needed something to feed that part of me, and I began creating items I needed in my daily life. Now, Fieldwork has become not only my job, but shared goal our family has. I am grateful to Isaac daily for pursuing this and pushing me to get out of my comfort zone. As A New Mom, where do you draw new inspiration from? From Luna, who makes me view life a different way. From my husband, who's dreamer soul is always present in our relationship. From other women, who have pursued a life of their own design. What is the latest “Leap of Faith” that you had to make, where your heart was ready but your mind was not there yet? Just becoming a part of Fieldwork in general, I was honestly so intimidated by the thought of creating something with my own hands and then putting it out there for the world to see. My soul knew I needed something creative, but my brain was so nervous. Could I do it, would people like it? Would I hate it and the time it takes from Sawyer? Would I resent it or not be good at it? All that doubt flows through your brain, but Isaac encouraged me, and then I just jumped in with 2 feet and have been loving every new creative step since. I honestly think I am just finding my creative niche and flow. How do you stay connected and in the creative flow with baby in tow? In the creative flow with Sawyer, it can honestly be challenging. There are time where I am working and she is getting upset, and I have to refocus my priorities. I stop what I am making, kneel down and look at those big blue eyes, and ask her what she needs. Usually it's to get outside, go for a walk or a picnic, which honestly recharges me. So it may take longer to complete any task, she keeps my mind and heart healthy. What makes you feel most Graceful and Victorious (what are your momma self care must do's)? Momma self care: taking time throughout the week to have a tea or coffee and walk, or sit and enjoy the sun. Take time for myself and allow Isaac some quality time with Sawyer. Doing Yoga or something active, like swimming or tennis with Luna, it always recharges me, and her, and makes us feel connected and grateful. Any fun family summer adventures lined up? Weekly Adventures to the Lake, Regular trips to the Mountains, basically as much time as possible outside. What are your rituals in regards to the New Moon and Full Moon phases (if any)? Honestly! Not too many. I grew up obsessed with the night sky and the energy it brings, I would sleep under the moon as often as I can, even now. The Full Moon in particular is fascinating to me, whenever there is one fully visible in the sky I try to take a walk, and meditate. It's power is intense and it always brings me back to the creator. It's an intention of mine to be more aware of the moon. Prayer: I praise God for I am fearfully and wonderfully made, Gods works are wonderful, I know that full well. If I can believe that about my daughter wholeheartedly, without reservation. Then it must be true of me. So even at my lowest, I was created wonderfully and powerfully. What was the greatest advice given to you leading up to becoming a new mom? That the one thing that will make the most difference long term in Sawyer's life is the time and love poured into her. It won't matter if for a meal we had fast food or If she didn't nap enough that day. It will matter that she felt loved and supported, that her mom took time every day and focused on her and loved her unconditionally. List one thing, place, or experience you are really excited about for 2017-18 and one thing, place or experience you are grateful for in 2016? 2017/18: I am excited to grow my business, and in that grow in my creative and mindful self. To launch our website officially, and curate a lineup of goods I am passionate about. 2016: Sawyer Luna Haines came earthside at the beginning of 2016. She rocked my world, turned it upside down, changed me soul deep and I couldn't be more thankful for her and the experience of motherhood. Kristen Adorned in the Kundalini Gown Short. Sawyer is wrapped in the Aura Leaf Co. Sling and rocking the "Myrah Backpack"
Such beauty and inspiration pouring out of this beauty. If you are attending the Bloom Festival in Edmonton this year you will have an opportunity to experience the craftsmanship and artistry of this mama and her hubby in the boho bazaar in October. To get your tickets visit this link. The Art of giving back is the Prosperity path. This meditation can be done for 31 minutes, out of kindness, but the requirement is to do it for 62 minutes. While you are meditating, ask for opportunities to flow into you. Posture: Interlock the index fingers, also called the Jupiter fingers, at the middle segment. The left index finger hooks down over the right. The right index finger hooks horizontally with the left. Bring the mudra to the heart center – with the arms parallel to the ground. If you hold the hands too low, it will cause a depression. Keep the spine straight. Eyes: Fix your eyes at the tip of the nose. Make your face totally relaxed and calm. Breath: Take the lips and make them round, as if you were drinking water. Then breathe deeply through the mouth. Exhale at the tip of the nose. Breathe in like you are breathing in prosperity, like you are drinking water. Drink the prana through the mouth and exhale through the nose. Mantra: Listen deeply to the mantra while you keep the breathe going. This sound of the breath and the mantra guarantees prosperity. Click HERE for the Sound Current. If you are doing this meditation for 31 minutes, continue Part I for 24 minutes. If you are doing this meditation for 62 minutes, continue Part I for 55 minutes. After approximately 11 minutes, the patterns in your head will start to change. Your body will start to relax and with those tensions gone, you will start finding new horizons. About 15 minutes into the meditation, you shall enter the zone of body repulses. That means certain things which have been blocking you will start to tremble. After approximately 22 minutes, you will start to face your mental blocks, which need your perfect attention. Keep the breath strong and full as the fight starts between you and your mind. If you do this once a week for 62 minutes at a regular time, that’s all you need. Within you there is a capacity to bring prosperity home and this kriya, called Jupiter kriya, brings prosperity home. It is powerful enough to clear out the garbage in your subconscious mind. Your own electromagnetic psyche shall be tuned in with the universal electromagnetic field. This shall give you special energy and competence. There is hardly any possibility you will have a problem. There is no chance of failure with this. Jupiter is the Lord of Knowledge. By the Jupiter lock you will invoke the Jupiter guidance. By looking at the tip of your nose, you will control your mind to achieve it. By breathing a full breath inside the pranic energy, you will bring the result home. By the sound current, you will change the neurons of the brain to set a pattern of success. There is a subliminal, computerized permutation and combination in the sound of the mantra to assure prosperity. Posture: Keeping the Jupiter fingers interlocked – raise the arms and hold the mudra over the head. Keep the eyes focused at the tip of the nose, with the same breath pattern, listening to the mantra. Continue for 5 minutes, whether you are doing the meditation for 31 or 62 minutes. This posture will establish the brain strength. It will strengthen the grey matter. It creates a halo around your forehead which is the sign of good luck. Posture: Keeping the Jupiter fingers interlocked – lower the arms and hold the mudra at the navel center. Continue for 2 minutes, whether you are doing the meditation for 31 or 62 minutes. Shake the hands and your entire body very vigorously for one minute. Every part of your body that you move will be your friend. I personally encourage you to try it out once a week for the next 40 days and experience the magic for yourself. As a mother what has been your experience of childbirth? With my firstborn, I had a very traumatic c-section. I was naive and young. I read a bit of Spiritual Midwifery by Ina May and thought i was all set…as soon as i got to the hospital I was asked if i wanted an epidural and i said yes..I was scared and didn’t know how much worse the pain would be. I realized I hadn’t actually prepared myself for the pain, and i was so scared! so whenever I was offered more I said yes. Because of all the meds I was given, pushing for 3 hours seemed pointless as my little guy didn’t move much. I was told I needed a c-section. I remember feeling like the biggest failure. I cried and cried but that was my fate. The c-section itself didn’t go very well and I was put under and I woke up an hour later to a nurse asking me if i wanted to meet my son. After that experience, i knew I had lost out on something, i couldn’t shake the feeling that a part of me was empty and missing. When i got pregnant 8 months later, I had already become obsessed with birth but I knew I was going to have a natural birth. I felt like I had no choice. At that point I couldn’t imagine going through what I had another time. I had planned a water birth at the hospital, but at 38 weeks decided on a home birth. I ended up delivering my baby girl in my candle-lit bedroom floor surrounded by my loved ones and amazing birth team. Nothing beats reaching down and pulling out your own baby. I felt that day I truly became the woman I was meant to. After my son’s birth I became obsessed with birth, I think becoming a doula was a healing thing for me, too. I wanted to help women have the births they deserve. My own experiences really pushed me towards becoming a doula. I know what it is like to be on both sides of the spectrum. But, as women, we posses this incredible power within, and I want to help women find that and really embrace it. Do you offer any additional services? For example: birth photography or placenta encapsulation? Yes! I also offer placenta encapsulation services. The placenta is the first thing that mama and baby create together. The only organ we create and then dispose of after 9 months. The first life line of your baby, how amazing! I am a firm believer in the healing power of placenta. I don’t really have a style. I think I just naturally am very nurturing and caring and that perfectly extended to my work as a doula. I believe that women are amazing portals between this world and the spirit world. Birth can be an extremely life changing and empowering experience for a woman, and I love to be a part of that. What makes you different from other doulas? There are a lot of amazing doulas in Edmonton! We are so lucky to have such a wicked community of birth workers that really love what they do. I don’t know if it makes me much different but I really like to delve into the spiritual side of birth and the changes it brings and the symbolism that emerges from that experience. For me, birth is so interconnected with death, its a coming into a new dimension and transforms the woman into mother. its about diving into the unknown and trusting in oneself and trusting the process. I honestly get goosebumps just thinking about it! what is your “philosophy on childbirth”? I believe that whatever a woman chooses is her choice. I have personally experienced the most drugged birth and the most perfect natural home birth. Whatever a woman chooses is the best choice she makes for the place she is at in her life. No matter what she chooses, that baby will be born and she will be a mama! what inspired you to offer the encapsulation of the placenta and the beautiful art work behind your process? Placentas are amazing! I never had consumed my own placenta before taking the course, but I had heard so many positive experiences, that I knew it was something I wanted to offer. I encapsulated my own placenta, while baby wearing my newborn 2 day old daughter and it was night and day how much it helped compared to not having it with my son. The placenta art is an extension of the intentions I have put into the placenta for the mama and baby. As soon as I touch a placenta, I always always get goosebumps and feel a connection to them, whether I have met them or not. I spend the cleaning process meditating and sending healing energy to the placenta so that it may help heal the mama mentally and physically. Whatever I am feeling I kind of go along with that and its crazy, I do the same process for every placenta, but every one comes out looking soo different! its amazing. What would you advise a woman contemplating on having a natural birth? i would tell her to trust herself. To listen to that voice deep inside that says yes. Its hard work and its scary and you might doubt yourself at 8 weeks or 32 weeks, but at the end of the day, your body is capable and you can accomplish it. We are designed to birth that is our amazing gift as women and something we should totally embrace. Whats your take on women sharing birth stories and gathering as support and healing in circle? So. Vital. I can’t even begin to tell you how many birth stories I read while pregnant with my second. It was like therapy for me, to heal from my past wounds, I have been to many groups and to speak with women who have gone what I did is so so empowering and healing. Thats why mom groups are such a thing these days! We are all on the same path trying to be the best mothers and providers we can. How can one find your services? You can check out my instagram (doulamoonyeg) or Facebook page Doula Moon Birth Services. December 19th 2016, My mother and I are cuddling on the daybed in our living room watching yet another romantic comedy, as-per our usual evening ritual since her arrival from California to the bitter cold of Alberta, Canada. I started to notice some slight surges as we were watching the movie at about 9pm or so... nothing too extreme. I figured it was braxton hicks since recurring episodes of those were becoming a thing during my pregnancy. Then these surges started a repeated symphony of surges about 15min apart. My mother had fallen asleep and i didn't want to wake her. Making my way towards the bedroom the surges aka contractions (sounds less daunting) become a bit more uncomfortable, I wake Robindra up to tell him and he began tracking the surges. They were anywhere between 15min apart and 35min apart. He decided that we were in false labor and urged me to try to sleep and to let him know when each surge came on. (We had NO sleep that night.) The surges were so strong that they would knock me out until the next one would come on. 8am rolls around the next day, December 20th and same same. Surges are now anywhere from 7min apart to 18min apart. I tell my mother "I think it's happening" and she is excited but that kinda hidden excitement that has a hint of worry. We prepared her with our at home water-birth plan and it was a bit overwhelming for her. She had all her babies natural yet under the care of a hospital birth. So this idea had not sunk in quite yet until the reality that it was now happening. The pain was like no other... Robindra was checking in with our midwife on the hour with our status, where we were and how far surges were and my level of energy, basically everything. She suggested that in order to get us out of this early labor we needed to do some walking. We walked 6 flights of stairs, up and down in our apartment building (I don't even remember how many times). There was a moment were I remember telling Robindra "I don't think I can do this! ", the pain was just too much. He then holds me in his arms and looks right into my eyes and wipes the tears off my cheeks and says "You are the strongest woman I know, Yes you can!" and kisses my forehead. At this point my legs are tired from all the flights of stairs and the surges are now more regular. I had physically given up. Robindra was feeding me fluids, keeping me hydrated while my mother had set up the birthing pool in our living room and was ready to go. To relax my body. I sat in the tub in our bathroom where the temperature was 10x's warmer then the birthing pool. Being in the tub was ultra relaxing and it slowed down the surges. By now it's 2pm and our Midwife dropped in for a checkup to see how far along I dilated... only 3cm. She estimates I have another 5-6 hours to go and suggests I get some rest and injects me with a shot of charcoal to aid with some sleep but it did NOTHING. By now it's about 6pm. My home has turned into a "Birthing Circuit Works", where the bedroom became the place to lay down when I felt like giving up and would have tender moments with Robindra encouraging me as he would hold my hand and spoon me as I would lay there in the fetal position. The tub became the place where I would relax and recharge. Now the toilet seat was where I did the most work. When I sat on the toilet my knees were high and my sphincter was relaxed and the surges were full on, stronger and quicker. All these places were on rotation. Two of my girlfriends had showed up around 6pm and their support and presence was everything I needed and more. My girlfriend Caren (now Soleil's God Mother) was in charge of handling my mother in case of an emergency, she would help keep her calm. My girlfriend Katya was there for Robindra and my needs. She helped me keep my breath focused and had all my needs met. One thing that helped me cope with the never ending pain was knowing that my mother did it without any drugs. And In knowing that I had no doubt in my mind that I couldn't do it. So grateful she shared her birth stories with me. By now it's 9:30pm or so... I am so wiped... I had mentally given up. Robindra and I were laying face to face, holding hands and before with every surge I would squeeze his hand with all my might and yet by this point my squeeze got weaker and weaker to the point of no more squeezes. And then... POP, my water broke! The contractions were now 3 back to back with 45 seconds in between the next set of 3. The pain was primal. I needed to mentally give up to be prepared for this level of discomfort. At one point my whole body vibrated as if I was having a convulsion... Katya said I was Transitioning into active labor and suggested I sit on the toilet to help move things along quicker. Robindra called the midwife and she said it would be another 2-3 hours until baby came. We got to the toilet and things intensified at an accelerated speed. (I still get glimpses of myself in utter pain every now and then with I go to use our washroom) I went full on primal. The surge would come on and my body would automatically push. It pushed so hard that it would knock me out of my rhythm of breath and would take over me. At one point I realized that I was being consumed by the pain and I had completely lost my breath. This was the moment Robindra says I transformed into a BodhiSattva! I recalibrated and reclaimed my breath and engaged in the full experience of my body fully pushing and at that moment Robindra saw the head beginning to crown. I knew then that I had but a tight and small window to make it from the toilet into the birthing pool. Katya and Robindra help me waddle over to the pool with the baby's head crowning, I then lifted my leg up and over and as I am about to say "the water is not warm enough", the first surge began and it knocked me to my knees. I felt baby's head and then the second surge came on and baby's full body slid out like a bar of soap. I gazed upon baby while under water with eyes wide open and then quickly brought baby to my chest. Robindra turned around, he had the midwife on speakerphone and sees me with the baby in my arms and is in utter surprise. I delivered and caught my own baby. Baby was peaceful and then threw up some thick, dark green, lava looking goo out, which I later found out was meconium. Soon after baby started crying. And took its first breath. We were all in a state of joy and shock. Baby had arrived on the eve of the winter solstice at 10:18pm. 15min into the amazement of this little soul my mother asked us what gender the baby was and to our surprise we find out it's a girl. I then look up at Robindra and tell him her name is Soleil Emerald Ray, the light of our souls. Soon after she latched on and my heart exploded with tenderness. At about 10:30 ish our midwife arrived just in time to assist in the delivery of the placenta. To my surprise it felt like I had two babies. The placenta felt like a second birth as I delivered it and realized it was the size of my head and about 2 inches thick. Originally Robindra and I intended on doing a lotus birth but in our current reality that was simply not going to happen as we moved from the birthing pool to our bedroom. So we prolonged the cord cutting to 3 1/2+ hours. Soleil was 6 1/2 pounds and measured at 22 inches long with a full head of hair, she was simply perfect. 3 hours later I asked Soleil if we could remove her from her life-force buddy, the placenta. She started crying, she went from a calm blissful state to a loud, heartbreaking cry. So I told her we would wait a little longer and to say her goodbyes to her buddy and that daddy was going to do the cutting. 45min later we asked her if she was ready for us to cut her cord and she made a little sigh like moan and we proceeded to clamp the cord and Robindra cut it. There was no cry what so ever. (I ended up getting her placenta encapsulated by a wonderful Doula and Placenta encapsulator, Justyna). Robindra placed the placenta in the fridge to preserve it. I had two tears, in upper tear that needed no stitches and a small lower tear that needed one stitch. Our midwife stitched me up right then and there. She also removed the birthing pool and follow up with midwifery paper work and then left us to be in our blissful state with Soleil. We did not sleep that night... we gazed upon her all night in awe... "is this real life?... is she breathing?... wow, i can't believe she is here.... We did it!... i.e. And Now we are at 4 weeks and 3 days and I don't even remember what life was like without her. She is my Sun. Thank you Soleil and Robindra for making me a mother. Practise banishing fear from pregnancy with this Kundalini Prenatal Yoga meditation. Here is a little truth behind the turban! It’s a scientific technology. When you activate certain areas around the cranial reflexology points it basically creates a turbine effect in terms of neuron velocity. Call it a cranial-self adjustment. It can give you a wilder, esoteric experience during meditations AND if it doesn’t? Don’t bother with it. What inspired you to hold women circles? I love attending women's circles, connecting deeper with myself and with other women. I'm inspired to hold women's circles to create a space of connection, healing and love. Illuminate us with your gift, Who is Ashley? I am working on a 200 hour women's teacher training, that is structured and built on applying tools to what our hearts offerings are and sharing them with the world. What are your Radiant Rituals? To ground into my body- I dry brush and then self massage a beautiful skin oil on, then adorn myself in something flowy with my Mala. Taking time each morning to create an elixir and my daily practice. Who and or What is your source of inspiration? Women. Women that share their voices, that rock what comes from their souls, Nature and my practice. Awakening Shakti by Sally Kempton, Heal Your Body by Louise Hay, Anatomy of the Spirit by Caroline Myss are my current choices. What is your self-care Ritual when the “pressure" is on? I take time to smudge, and then I sit and usually chant to Ganesha, and then I take time to pull some cards and then Journal; after I nap and then usually everything becomes clearer. If I don't have time for all this I put my feet in moss. How can experiencing the gathering of women impact your community? I am so excited to see how these wonderful circles impact the community! I imagine there will be connections, collaborations and beautiful empowerment. Where do you hold La Luna Social Sisterhood Chapter? Different locations throughout the city for now. I begin each morning with gratitude and prayer before I get out of bed. Whether I speak it out loud or in silence or write it down, saying "thank you" is a must do and I do my best to recall the messages that came forth in my dreamtime too. I feel blessed that often I receive a special morning delivery from my Beloved Shems, of either coconut water and lime or turmeric/ginger/lemon tea (or both, all local from Maui) since he is most always up before me and I'll make it for us on the rare occasion I'm up before him. Nourishment is a must. Once out of bed, my morning ritual is to show up for myself to connect with my breath, body, spirit and to connect with Nature. What actually happens can look different depending on if I'm at home, traveling or what I'm currently devoted to and focused on. This can range from simple empty presence meditation to kundalini yoga to dance to breathwork and can be 15 minutes or a couple hours. I do love to get up with the beauty of the first light if possible and walk on the beach and swim or practice yoga or Qi Gong or I'll go outside to our rooftop deck and greet the ocean and practice there. More often than not, my daily practice is a 40 day Kundalini yoga kriya or meditation. In my online offerings we do this together as a global sisterhood 4-5 times a year. We've just started one that supports the rising of leadership with self love and womb sovereignty. And I'm currently devoting my 40 Day practice to #StandingRock. And a delicious, nurturing breakfast is a must for me. I love this question. I have a several. There are some that show up for a time and then leave and others that are with me always. The first animal totem I connected with was the mythical Unicorn at a very young age and then the Raven when I was a teenager, which was part of a powerful awakening in Nature whilst on a 'solo' in a Leadership Training for a Camp that was based on First Nations traditions on Vancouver Island. Raven and Unicorn are both animal spirits for Magic. The White Owl the spirit animal that has been my main totem for the past several years who visits me regularly on Maui at times of great poignancy and synchronicity. I feel her ally-ship and guidance strongly. She is the carrier of keys who travels between the worlds to deliver messages from the spirit world to the physical world and from the physical world to the spirit world. Other spirit animals I am deeply connected with are Serpent, Wolf, Whale, Dolphin, Jaguar, Hummingbird and Dragon for the gifts of transmutation, wisdom, sacred song, play, integrity, joy and alchemy. What is the true essence of “Goddess Rising” and what inspired you to create this platform for women? The essence of Goddess Rising, as a Sisterhood, is to transform how we relate to each other from competition and comparison to collaboration and celebration. To create, cultivate and sustain sacred connection and support whilst navigating this journey of life. With this foundation, as a Mystery School Temple, Goddess Rising serves to reconnect women with their wild and sacred selves through the remembrance of their lunar rhythms, the power of their womb, and the goddess mysteries to rise in empowered living and leadership with pleasure, passion and purpose. This creation of this was simultaneously inspiration and divine assignment. All was revealed to me, one step at a time. When I reached a place of healing within my own womb space of intensive menstrual cramping, that my cramps were also the collective cramp, and the way to the other side was through the pain, I knew that I needed to share this with other women. To support their individual journeys. This was at the same time of coming into an empowerment within myself in my relationships with other women, to support and celebrate on another and to step out of the disempowering game of separation, gossip, jealousy. I knew somehow that a sacred space for women was going to be birthed through me. And felt the call to create a platform for the Goddess to truly RISE through all of us, to return to the ancient ways and for the power of the Divine Feminine to work her magic into the physical. I felt and heart the soul whisperings in late 2011. Then on the first day of 2012 I had a profound experience at Amma's Ashram in India guiding a New Year's workshop for women, where I knew that everything from then forth, and all of my training was to be in focused with devotion to the healing and empowerment of women. Always, Amma. Always. She is my muse, my teacher, my sister, my guru, my spiritual mother. Her whole life is devoted to Love and Service, continually offering her whole Self to uplift humanity. It is said that Devi comes. Breath and my mantra. Music and movement. Dance and play. Stillness & Presence. And it's different for me, depending on the phase of the moon cycle. I am guided by my inner rhythms to move and dance when needed, rest when needed, take action when needed. And I love my tea! Expressing myself through dance, sacred self care, prayer through voice and activism and guiding women in reclaiming their super powers! I feel victorious when I am serving and on my purpose out of loving devotion. Describe the feeling you wish women to feel during your ceremonial offerings? Safe, accepted, connected, inspired, empowered. How has ceremony and Ritual altered your life and when did it begin? This is an interesting one for me. I'm not sure it's completely altered my life, because I feel it's always been with me in some way, but it has evolved. Ceremony first began for me at young age during the Potlatch ceremonies I used to attend. There was always a sense of mystery and magic for me and I also felt so at home. Since my early twenties, without anyone telling me how or why, I began to offer my moon blood to Mother Earth. This, along with other blood mystery rituals has created and sustained a very deep and powerful connection for me with Mother Earth, with Great Spirit and my intuitive gifts. This also healed the extreme symptoms I used to have during my moon time, when I menstruated. What are your personal rituals in regards to the New Moon and Full Moon phases? At the new moon, I set new intentions with our Global Sisterhood and have been hosting this free ritual for 30 moons now. Though this is for our sisterhood, it is also a way of me personally serving, which is important. At new moon I often paint, draw or dance my theme or intentions for the month. I will bury or place on the earth my crystals (esp my yoni crystal). Most often, I go to my personal mantra, which was giving to me by Amma in 1997. These personal mantras are only between teacher/guru and student/disciple, so I can't share what that is. Currently, when I translate an energetic feeling that I'm carrying, and translate it into a mantra, it would be this, "I trust in the rhythms of life and am supported in all ways. The universe has my back." What does living in the Aquarian Age look like for you? For me this about embodying/living my fullest potential, uniting spirit and flesh. My life is a living prayer. For me, there is no separation between spiritual life and householder life. They are one and the same. This means doing the laundry, gardening and meditating. It means chopping the veggies with my mantra. It's utilizing technology in a conscious way to share my message, art and teachings, to connect with our global family and accomplish the work we were set out to do to collectively raise the frequency of love and consciousness to the masses. It looks like having a glass of wine and chocolate when I will appreciate it and chanting for world peace on a daily basis. Om Lokah Samastah Sukino Bhavantu is one that I use A LOT. Which means, "May all being be happy and at peace." In your opinion, what is the most powerful thing we can do together as women on this similar path to create real impact in our communities, families and cities? Cultivating consistent connection in a sacred way. When we connect in love, hold space and support each other, keeping each other accountable to our commitments, desires and dreams, we are indeed creating powerful impact locally and globally and fulfilling our individual and collective dharma. What are you grateful for in 2016 and what are you really excited about for 2017? 2016. Big year. And it's still not over. I'm am deeply grateful to have co-created with Joanne Ameya, our first ever Moon Temple Facilitation Training and our Temple Woman of over 100 pages of powerful content for woman to rise in their leadership. This training has been so beautiful, edgy and potent. These incredible women who will graduate soon and complete their certification are then the first wave of Moon Priestesses to be a part of our Goddess Rising Moon Temple Collective! This is a this vision I've held dearly for sometime and now it's blooming to life. The training was birthed this year and then our Moon Temple Collective will be officially birthed in 2017 (our Instagram account is @goddessrising_mooncollective, for anyone that wishes to stay connected with all the women who are sharing their gifts and moon medicine with Red Tents and Moon Temples around the globe). On a personal level, I am deeply grateful for deepening relationship, love and partnership I share with Shems. We share a bought a home together a few months ago (which is HUGE) and we have been 'summoned by the universe' to co-create together to offer Empowered Loving courses/journey/retreats together for couples beginning in 2017. I'm very excited for what we are concocting right now, to be served up next year. It feels timely and so needed. I've been asked my so many women for this, and I'm overjoyed to be able to share that it's in the creation phase! In numerology, 2016 is 9 year, which is all about universal brotherhood/sisterhood and completions and 2017 is a 1 year. So, another cycle coming to an end and beginning. I feel excited about the Mystery right now, as there is much that is stirring in the cauldron that will be revealed when it's ready. Some of my best memories have been in relating with the women in my life. Whether sister, mother, aunt, or friend, women-centric support is vital to engaging our natural state as women. I want to foster and cultivate this natural state by bringing women together to share, support, and celebrate one another. Illuminate us with your gift, Who is Josie? At the moment my most treasured gift is sharing the motto 'self healing is self discovery' and I do so through my brand Curandera Remedies. This is the platform I created to share inspiration, information, & products with anyone interested in the process of self healing. It is very important to share that our healing process is also the way to get to know, reconnect, & discover our true inner selves. Oh rituals.... These are the moments during the day I get to stop and breathe deep... Lately the most important has been abhyanga massage (a warm oil, full body massage), it's an excellent way to connect to your body and stay grounded. Other daily rituals that keep me focused and feeling divine are simple like mantra, meditation, conscious eating, & tea/ coffee ceremonies. A constant source of inspiration are my students and clients. I'm filled with gratitude for their courage and trust. I'm also forever inspired by the women who have come before me and paved the path for self expression like Sabina, Kahlo, & Modotti. I take a moment to do some mantra meditation, pranayama (breath work), and a spritz of gem essence floral water with rosewood essential oil. It's like hitting the reboot button. Please connect with this luminous sister here and follow her wisdom and bliss. I usually wake up around 6, next to my daughter. She usually comes into our room after my partner gets up for his Sadhana at 4am. I kiss her, or touch her soft youthful cheek + whisper a little blessing. Now that my daughter is older, I have adapted my morning practice to be more solitary, when she was younger - it would be I was just with her + would chant mantras. I sneak away and go boil spring water for tea. I have an outdoor space that I sit at for tea + meditation, if its cold - I bundle up, but if it's raining it can get wet, so then I would sit inside. I chant 5 sacred warrior seed syllables - tibetan sound healing, while my water boils. Once my water has boiled I sit for 3 bowls in meditation. I pay my respects to the rising sun + give thanks for the birdsong. I meditate on the elements and how I can embody positive aspects of the Tattvas as I move through my day ie: (strength, inspiration, creativity, conscious communication, devotion etc) On my 4th bowl, I pull a card, and sometimes I'll free write, but often times my daughter has joined me and will snuggle up under the wool blankets as I finish up my tea. She stays quiet and waits to draw animal cards with me, she loves that. My morning rituals do fluctuate with family life - if I have time after my tea I will do a few kundalini exercises to wake up my pranic body, then I do kundalini meditation (sodarshan chakra kriya + mantra for the divine feminine) otherwise, sometimes I have to wait to do my sadhana in the afternoon. I feel a kinship with the Deer. I journeyed once to find my spirit animal + met a deer in a dense forest. At first I had wished a more "powerful or exotic" animal came through to me, but after some reflection, I felt the deer was perfectly right! Although they are generally common animals to see out and about in the Canadian wilderness, I often come across them on my own, when I'm walking in nature with my daughter and it warms my heart + feels like I'm on the right path! The deer is a symbol of the mother, intuitive, gentle + compassionate. A deer is highly attuned to nature + their surroundings to protect themselves + their young. Deer Medicine is about unconditional love, and to walk the path of love with grace + awareness requires we love ourselves and know how to protect ourselves and our energy. The Deer is intuitive + watchful, never forcing she nurtures the beings around her through love + acceptance. Radiance + Ritual is in essence is an ongoing evolving collaboration of women so that we may reflect each other's light + learn from each others strengths, culture, creative gifts + wisdom. In the Kundalini tradition, we have 10 bodies, not just the our physical one-- which there has been such a strong fixation on in media etc, and therefore led to much disconnect + suffering in our feminine lineage, as we have felt shame, discrimination + unworthy by this association of the physical body fitting into a certain mold. Our 10th body, our Radiant Body, is our projection of courage and grace as we rise together in facing the break down of these old ways of being and aim to come into greater harmony as a society + create a more sustainable way of living on our planet. Ritual, gives our lives meaning - which is how I have viewed my spiritual practice since I was a girl. My mother encouraged us to watch the seasons + celebrate these changing cycles with little rituals we would create. There was no set way - but there was always reverence, respect and heartfelt gratitude. Every woman, every family, has little rituals they observe to bring meaning + sacredness to everyday life. Some may be rooted in deep ancestral cultural ritual and observed to keep that connection to their lineage + past. Other rituals may be based on personal beliefs or self-care, I feel any act of devotion done with presence is a ritual and I encourage all women (beings) to dedicate some time to pure presence + honor what lives in their heart. My daughter! Her innocence + purity give me hope and purpose. She inspires me to set the vibration of my future in a positive + creative way, to set an example. Its important to me she see me practice, being kind, choosing high vibration language, collaborating with women + building community so she can be a leader among the next generation of young women. Moving my body in a non-linear way, dance + flowing on my mat. Observing nature, singing + chanting, keeping up with my practice, cooking nourishing food for my family. In my tea practice I am aiming to be as graceful as I can, savouring moments of stillness + perfecting the art of placement. I am aiming to have this graceful feeling + placement in my home AND its a work in progress! I feel victorious when I accomplish my to do list on any given day + have time left over to spend time with my partner to do something spontaneously romantic. New Moon I hold a monthly gathering at The Dharma Temple. It is unique every month where a new woman is invited each new moon to share their Radiance + Rituals. We learn from each other, even when (especially when...) we are different. There is always something to learn from other women, the way she approaches her practice, her rituals, we see ourselves in each other + it is through this reflection that we grow. There is something so special about being in sacred sisterhood under the new moon, which is most potent for setting of intentions. Full Moon - I usually need a good shake out! I take time to dance in my home, practice Kundalini Yoga + meditation and prepare a meal for my family to celebrate the fruits of this moon cycle. I'm planning on organizing some upcoming Full Moon Meditations for Mamas at the Dharma Temple very soon - stay tuned for La Luna Mama! Ang Sang Wahe Guru is an important mantra to me when I find myself in times of doubt, fear or lack I vibrate this sacred sound current that means: "The dynamic, loving energy of the Infinite Source is dancing within my every cell, and is present in my every limb. My individual consciousness merges with the Universal consciousness." I'm so excited to be building this community at The Dharma Temple in Vancouver and am so grateful for this past year of moving through some really hard times to come out where we are now. I feel very supportive by the growing community of women and mamas that is La Luna Social and Radiance +Ritual, it's an amazing time to be alive! The sacred space we are cultivating in our neighborhood (Mount Pleasant) is where we are sharing the teachings of Kundalini Yoga as taught by Yogi Bhajan, Dharma Yoga + other spiritual technologies from the mystic's + wisdom traditions that really inspire + serve people. That feels really good. In 2017 I'm looking forward to launching some new programs for women and more collaboration + travel! I'm super excited about the growing boutique at the space, which has a collaborative energy to it as well. We have ritual items, aromatics + adornments to enhance your spiritual growth/practice that I curate much like the moon temples. I provide different local artists a chance to house their wares in a prime retail space on main street for specific cycle. In this way, people know where they can find these goods + people practicing or who are in the space get a chance to experience new products all the time. I'm excited to expand on relationships with local artists, yogis, women + visionaries as we grow The Dharma Temple. SJ will be in Banff on October's New Moon for a beautiful New Moon Ceremony Gathering. Click here for more info.. Inspired to share your gifts with us? Join our mailing list in the contact section and we will send out emails to our community on how to get involved and help us grow this global movement.